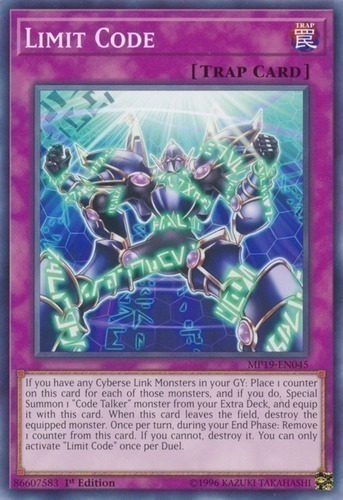 If you have any Cyberse Link Monsters in your GY: Place 1 counter on this card for each of those monsters, and if you do, Special Summon 1 "Code Talker" monster from your Extra Deck, and equip it with this card. When this card leaves the field, destroy the equipped monster. Once per turn, during your End Phase: Remove 1 counter from this card. If you cannot, destroy it. You can only activate "Limit Code" once per Duel.